RAF St. Lawrence was located on the coast about two miles west of Ventnor. 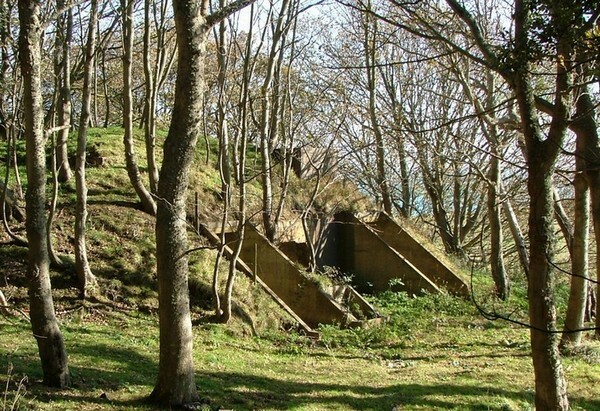 It first became operational with mobile equipment as a reserve for RAF Ventnor. But then the site was used in 1941 to construct a buried reserve for Southbourne, near Bournemouth. 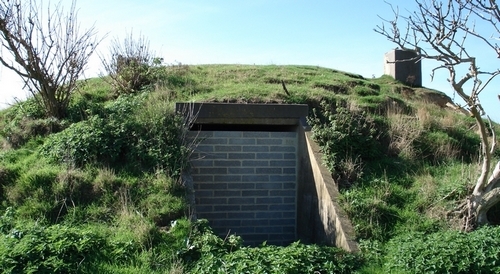 However, when the semi buried installation had been constructed it was obvious that it had a dual function as an Emergency Alternative Reserve for near by RAF Ventnor. This was because the Buried Reserve puzzlingly constructed in the same compound as the St.Boniface main site was considered belatedly as equally vulnerable in the event of another air-raid attack there. 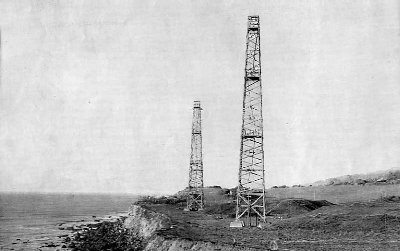 In use, unlike at Ventnor, the St.Lawrence site was found to have an excellent height finding capability, being situated only 44 feet above sea level and because of this it took on 24 hour working. Accommodation for personnel was at Ventnor and in local hotels. Line of shoot was 170 degrees, i.e. 22 degrees more southerly than Ventnor's, so the coverage would not have been exactly the same and the range obtained would have been shorter too. The two wooden towers were both 105 feet tall. The site continued in some use until 1947. A plaque of commemoration was unveiled on April 10th.1994 at the Old Park Hotel by Lady Barclay and Sir Peter Anson as part of a weekend reunion held there. The author was invited to this event but declined, a decision now regretted. See P.S. below. The slot at the top of the blockwork allows the Interestingly Specially Scientific bats an unrestricted lifestyle. The transmitter dome is equipped with an elaborate feeder portal. Or from the air this Google Earth extract gives a perfect impression of the site layout. The bunker shown below exists 200 yards inland from the two other bunkers and is also only partially buried. It is the "Stand-by set house" i.e. where the emergency diesel motor alternator was situated. In September 2013 a planning application was provisionally approved for turning this building into a residence. The applicant cynically stated that this would be the best way of preserving an historic building of national importance for posterity. Hmmm. One feels this is a specious argument for how does one preserve something as an historical object by modifying it radically, especially the interior, and indeed, adding to the structure? To the extent of three bedrooms and a lecture room, would you believe? Go to Planning Application and type in TCP/31377 to view the plans. Or alternatively, Utube provides an excellent tour in and around the building. When the new residents move in they may believe that they are living in a former operations room surrounded by the ghosts of the WAAF personnel and their highly technical equipment, but they should know that the actual scenario was a thudding diesel engine occasionally attended by a denim attired erk, and an all pervading aroma of grease and diesel fuel. There are also associated buildings in the trees. 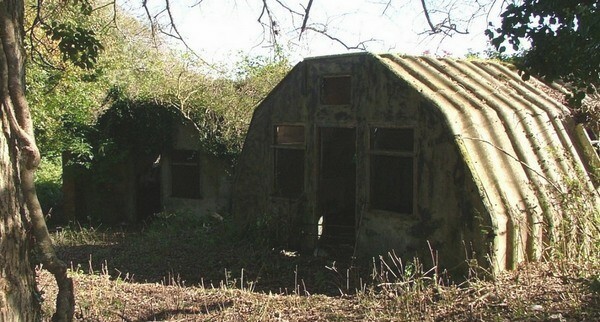 These seven sided asbestos-cement Handcraft huts are quite rare survivors. It is good news that the new owner, a local architect (of some renown due to the Grand Designs TV program) has commenced to renovate them to use as work studios. 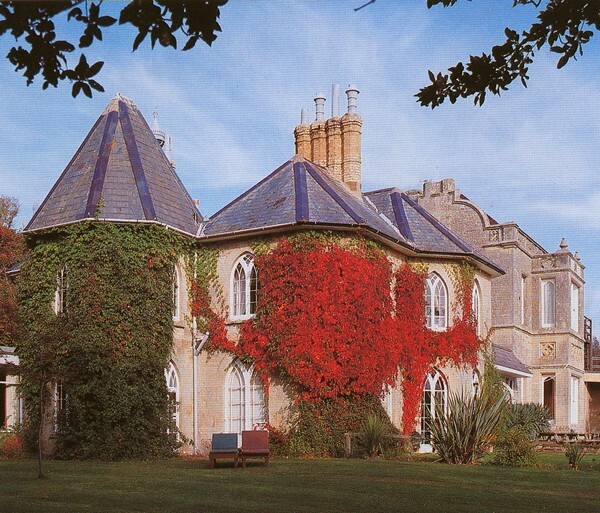 The Officers' Mess was in the nearby Old Park Hotel shown below and the other ranks were accommodated in the Rocklands and Whitecliffe hotels. The bunker and huts photographs taken & kindly supplied to be displayed here by 'Barrie H', another Island resident. The area is known as 'Woody Bay' and the site is at Grid Reference 532761. It is easily visited as the coastal footpath passes extremely close to it. It may also be approached via a short footpath (No.V97) from Woolverton Road, St.Lawrence. When visiting the site with Harold Lewis in early October 2006 the Estate Manager hastily and unexpectedly joined us. He brusquely pointed out that we were on private land and that we ought not to be, especially as it was a Special Site of Scientific Interest due to it having become the home of an unusual species of bat. This was news to both of us as there were no signs in evidence indicating either fact. 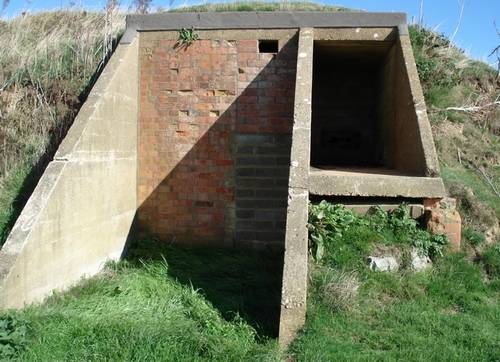 So would-be visitors please be advised that this is the case and as the bunkers are sealed and as it is perfectly easy to photograph the remains from the closely adjacent coastal path, there is nothing at all to be gained but an up to £20000 fine for venturing into the field. The buildings in the trees should be regarded as even more strictly off-limits. Any enquiries concerning a closer inspection of the site must be addressed to the owner, tea magnate, Mr.S.Twining OBE, Woolverton House, St.Lawrence. I sincerely apologise to Mr.Twining for the intrusion of two non-vandalising pensioners (who indeed have a greater interest in the preservation of the site than some people), and hope that this announcement will wholly mitigate what was after all but a very mild act of trespass and indeed one unwittingly caused as there was certainly not one warning sign in evidence at the time. Please consider my forelock duly tugged. 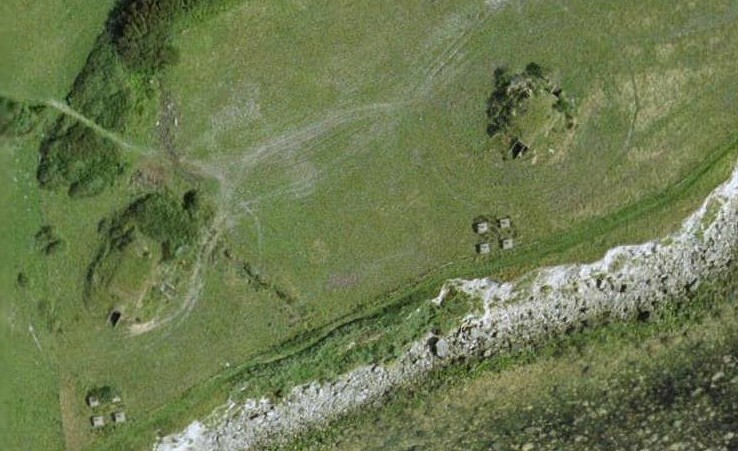 Recently, in the interests of the interesting bats the site owner has elected to disfigure this historic and possibly unique (by virtue of its completeness) site by banking earth against the bunkers. See the latest photographs of the site. However, after consideration one may see this as a happy compromise indeed : one may be happy for both the bats and the future military historian. The bats have a secure home and the blocked entrance would be but a minor barrier for a future authorised and determined excavator, but would very likely deter the casual vandal in what will probably be a very lengthy meantime. 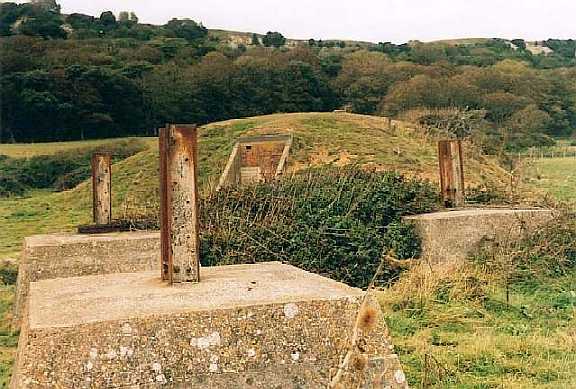 There is a persistent legend regarding the St.Lawrence site in that it suffered a German attack in retaliation for the British commando raid on the St.Bruneval German Wurzburg radar site in February 1941. One story suggests an attacking force from Guernsey landed by Eboat but another suggests they were landed from a U Boat. Other suggestions are that defending Home Guards were killed and/or abducted. The author has always been somewhat sceptical about this matter but recent research by Adrian Searle, an author of some local repute who is most interested in the Island's military history, has revealed that this might well be true. Adrian has just (10.12.16) published a book about this and it is a book which could very well cause national interest as successive governments have kept this under wraps for so long. The reasons for doing so at the time are easily understandable, but surely there cannot be any now, seventy years after the event? There is an element of irony involved here as Germans owned and occupied the adjacent hotel building and land from 1882 to 1906! Take leave...or...Return to the CH Page. Hotel picture from their own brochure.